The microwave is one of the most popular kitchen appliances because of its time saving method of cooking. In a fast-paced life style, the microwave has been a most welcome change to any kitchen. Restaurants have also learned to love the microwave oven because it allows them to serve their clients faster and keep foods at a desired temperature. When your residential or commercial microwave breaks down, it is serious. It can cause a lot of hardship at home or in your business. A repair needs to be done quickly, especially if it is an easy repair that can be completed by you. Appliance Repair Experts has a large parts warehouse that is open to the public and is fully stocked with all of the moat common repair parts for microwaves made by any manufacturer. Our sales staffed I fully trained to assist you in finding your needed part in a quick and efficient manner. If you are not sure what you need, we can help. Our staff is trained to help diagnose repair problems, suggest necessary parts for the repair, and give helpful tips on how to complete the project safely. If it is discovered that the microwave issue needs a professional service call, our staff can also arrange for a tech to go to your home or business to make the repair. Our conveniently located warehouse is open from 8:00 a.m. to 5:00 p.m. Monday through Saturday. Call or top by to pick up any part you need to repair your microwave or other appliance. If you are in a hurry, use our parts finder service on the website and we will have what you need ready for your arrival. When it comes to microwaves, we encourage our clients to take caution when making repairs. Simple DIY repairs should be easy, but anything mechanical should be handled by a professionally trained repair tech. 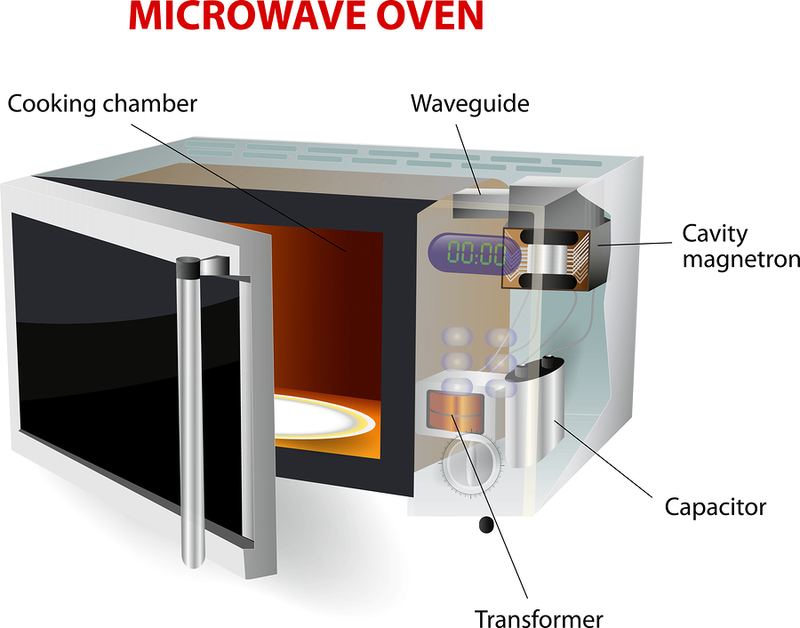 Microwave technology can be very dangerous if handled or repaired incorrectly. We encourage ll clients to speak with one of our trained staff members about the potential risks of repairing your microwave without proper training. The microwave oven always seems to build up food particles in the interior, leaving it quite the mess. Instead of trying to scrub the interior with harsh chemical or an abrasive sponge, both of which could harm the unit, try cleaning it the easy way. Take a microwave safe bowl that is large enough to hold about two cups of water. Add a liberal amount of dish soap, lemon juice or vinegar to the water – but only use one, and run the microwave for one minute on high. The water and cleaner will “cook” and condensation will form on the interior walls of the microwave. Open the microwave door, carefully remove cleaning solution, and use a soft cloth to wipe away the condensation. This will leave your oven clean and it will not have unwanted residues in it for the next time you cook. As an additional bonus, the water was never touched in the bowl, so this cleaner can be used up in the rest of your kitchen so there is absolutely no waste.